Team USA brought the medal total to 21 --including 11 gold-- this week on the final day of the IAAF World U20 Championships, with two bronze in the 1500m and 100m hurdles thanks to Christina Aragon and Tia Jones, plus twin gold medals in the junior men's and junior women's 4x400m relays. Tia Jones won bronze and Alexis Duncan placed fourth in the 100m hurdle finals as both girls ran under 13 seconds: Jones in 12.89 and Duncan in 12.93, a new PB that makes her the third-fastest prep of all-time. Christina Aragon won Team USA's first-ever world U20 medal at 1500m in taking third with a final time of 4:08.71, which improves her own No. 4 all-time ranking for U.S. preps. Alexa Efraimson, who was vocal about wanting to earn America's first medal here, placed fifth in 4:10.23. Brian Bell of the University of Houston took seventh in the 800m final with a mark of 1:47.68. Robert Heppenstall, who attends Wake Forest, took fifth in 1:47.33 for Team Canada. Nicole Greene of UNC Chapel Hill, seeded 11th in the high jump, took fifth overall in the final with a mark of 1.83m/6-0. Kai Benedict of Cal placed 14th in the 3K steeplechase with a new PB of 8:49.13. Team USA closed out the day by sweeping the 4x400m relays; the junior women ran 3:29.11 and the junior men ran 3:02.39. Both are U20 world leading times. After a slow start out of the blocks, national high school record holder Tia Jones ran under 12.9 for the second time in her career to win 100m hurdles bronze in 12.89. 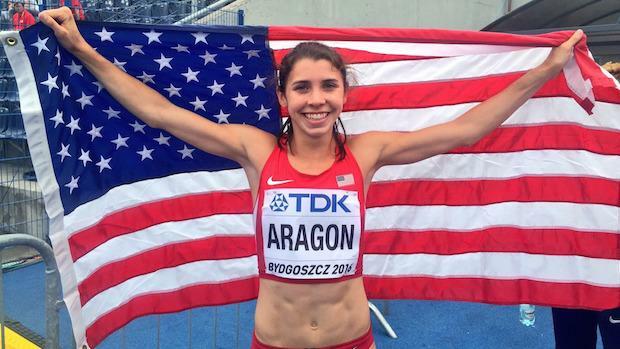 Christina Aragon became the first American to win a 1500m medal in the history of the IAAF World U20 Championships, previously called the World Juniors. She dug deep to set a new PB of 4:08.71 to take bronze. Aragon ends her high school career as the fourth-fastest prep ever to run the distance. She will attend Stanford next year. 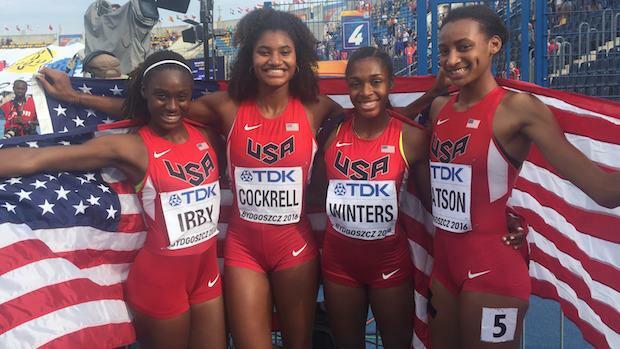 The Team USA junior women's 4x400m relay clocked a U20 world-leading time of 3:34.64 in the prelims, only to be one-upped by Jamaica in the next section as they ran 3:33.18 to make short work of their heat. The U.S. switched up their line-up for the finals by adding in Lynna Irby, the 400m silver medalist, and Anna Cockrell, the 400m hurdles gold medalist, to Karrington Winters and Sammy Watson. Irby handed off evenly with Jamaica and then Cockrell faced the 400m gold medalist Tiffany James, who had run 51.32 to win on Thursday. Cockrell split about 51.0 to close the gap and then Winters blew the race open from the Jamaicans to safely hand off the baton to Watson, who closed in about 52.47 for a total time of 3:29.11 over Jamaica, who ran 3:31.01. The Team USA junior men's 4x400m faced even more of a challenge in their race from Botswana, who looked insurmountable after clocking 3:03.75 in the prelim and the U.S. ran just 3:07.87. Yet a botched hand-off slowed their time in the prelim and this time Champion Allison handed off perfectly to Ari Cogdell. However, Cogdell faced a powerhouse on the second leg in Botswana's Baboloki Thebe, who was brimming from a disqualification in the open 400m and ultimtatlely split 43.5 here. Kahmari Montgomery made up a bit of ground while splitting 45.27 but then it was up to London -- who ran 44.82 to nip Botswana at the line, 3:02.39 to 3:02.81. Botswana's time registers as an African U20 record. No American had ever medalled in the 1500m at the IAAF World U20 Championships -- until today. Two Americans entered the final today: Alexa Efraimson and Christina Aragon, both of whom hoped to be the first to break the curse. Oonly in two other years --2008 and 2014-- have two athletes worn the red, white and blue in the 1500m final at this event. Bobby Clay of Great Britain took the pace out in 1:07.63 for 400m and 2:14.96 for 800m with Efraimson right on her shoulder and the full pack of 12 hanging right. As they neared 1200m, Adanech Anbesa of Ethiopia --who has run 4:05 this year-- took the lead and passed for the bell lap in 3:20.98. A pack of four separated themselves on the backstretch: Anbesa, Efraimson, Fantu Worku of Ethiopia --another 4:05 performer-- and Aragon. As they rounded the curve for home, Anbesa and Worku slightly separated themselves and Winfred Nzisa Mbithe of Kenya charged to the top group. When the dust settled, it was Ethiopia with a 1-2 sweep as Anbesa ran 4:08.07 for gold, Worku clocked 4:08.43 for silver and then Aragon (!) earned bronze with a PB, 4:08.71 effort that improves her own No. 4 all-time ranking for U.S. preps. The mark also elevates her from No. 5 to No. 4 on the U.S. U20 list, ahead of Suzy Favor Hamilton's 4:09.10 from 1987. Efraimson, a Nike professional who is the American U20 national record holder at 4:03.39, faded to fifth in 4:10.23 as Mbithe ran 4:09.25 edged her for fourth. Clay was seventh in 4:13.09. "Before we ran that, Karrington was saying, I want that flag, I want that moment. You guys had that moment, I want it. So I think that's what all of us were thinking about. I want it for me, but I really wanted it for them, too." Botswana entered the 4x400m relay finals as the favorites after running 3:03.75 to win their prelim. The USA ran just 3:07 in the first round, but ran with confidence in the final to take down Botswana, 3:02.39 to 3:02.81. In the video, Team USA cheers on anchor Wil London as he runs down Botswana for gold. Roster: Ari Cogdell, Champion Allison, Kahmari Montgomery, Wil London. The meet's over, go home! Check back for full-blown cross country coverage this week.